"In these seemingly 1970's times of violent and hideous intolerance towards people of race, religion and culture, perpetuated by the over-zealous scaremongering of the right-wing press we wrote 'The Rabies are Back' from the perspective of these little booze cruise Englanders, those Union Jack short wearing, Euro lager drinking, chicken masala swilling, Lidl shopping, hard Brexit cheering, refugee baiting, balls of contradiction. We shot the video on the outskirts of Sheffield in the Peak District. Lias came up with the idea of shaving with a giant log as a representation of the human struggle, so he went in to this wood and found the biggest, heaviest trunk he could find - and we attached a razor blade to the bottom of it. Just holding the log on its own above your head was hard enough without getting a serious muscle wobble, but factor in that there was a really sharp blade on the end of it, plus quite a high wind on top of this hill/cliff face, a lot of things could have gone wrong. Thankfully no major arteries were severed. You'll also notice 2 monks dragging a child's dingy filled with blood across the landscape, that was our tribute to the refugee crisis with a nod to Herzog's Fitzcarraldo." Thank you to Noisey Music for helping share this first. 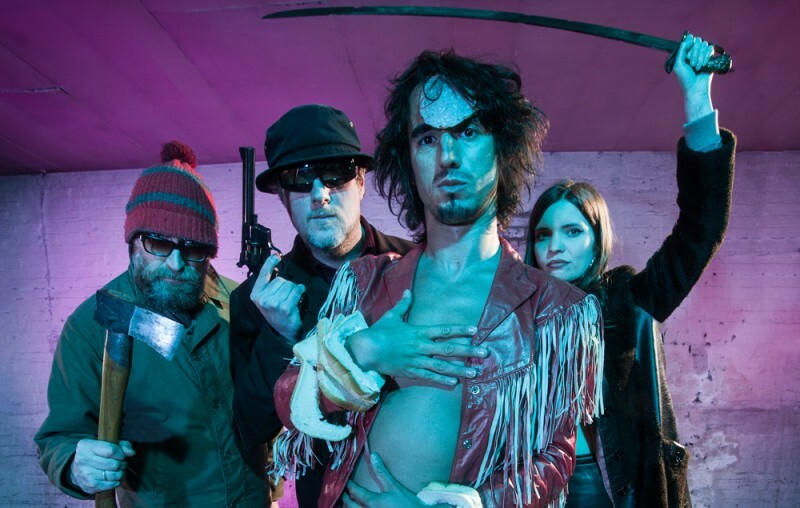 The Moonlandingz debut album came out 24 March 2017, and is available on LP or CD via the Transgressive Shop and in all good music shops.